This sounds really, really interesting. I liked The Road, and I’ve been curious about this book for awhile. Time to try Saramago I think. I think this might be one for me to avoid, as I get squeamish about descriptive violence. Too bad, though, it sounded really interesting. I have Death With Interruptions by Saramago on my shelf and am really looking forward to it. I’ve never read anything by him. I am really pleased that you enjoyed this book – it is one of my favourites. I hadn’t really thought about the questions you ask. I guess that he ended it with everyone regaining their site so that it ended on a positive note. I liked the fact there was hope for the future instead of endless darkness. I think the wife only kept her sight as it was important for someone to be able to see what was going on. I’m not sure Saramago has a medical justification for it. I’ve just started to read Seeing. I’ll let you know my thoughts soon. I have had this book on my shelf for awhile now and must admit that I have been a bit intimidated about it. I have heard other reviewers say that it is a powerful, but disturbing read. I have not yet read The Road either, so I am not sure if the subject matter would be too dark for me, but after reading your review, I am placing this book higher in my priorities. I also think that I would be interested in All the Names, not only for the comparison between these two books, but also because you rated it so highly. I really liked this review, and even though I skipped over the spoilers, I feel that I have a better grasp of the book and what it has to offer me now. @ Sarah: I think you’ll really enjoy Saramago, and if you enjoyed The Road then I think you’ll do just fine with this one! @ Amanda: Given that you don’t enjoy graphic depictions in your fiction, I do think this might be a book you’re better off avoiding. But there are plenty of other things by Saramago that you can try instead! @ Jackie: I know this is one of your favorite books, so I was really excited going in! It did not disappoint! Re: SPOILERS!!! I wasn’t exactly hoping for a medical explanation for the blindness, but I thought that perhaps that blindness was meant to symbolize something, and I wondered if there was a specific reason (philosophical or otherwise) why the doctor’s wife was spared. But perhaps it’s as you said, and Saramago just needed someone who could still see to tell the story. @ zibilee: There’s really no need to be intimidated by Saramago! Yes, his writing is not very traditional, but I find the fluidity to be pretty accessible and not necessarily all that challenging. In terms of this book, I found the content much more difficult than I did the writing, but I don’t think it’s something that you couldn’t handle. @ Jill: For me, even though there were rough patches, I found the book worthwhile because of all the interesting ideas that it presented. I thought it was worth it, but I do see (ha!) that it wouldn’t be a good fit for every reader. This does sound very bleak but I have heard so many POSITIVE things about it, I may give it a try in the future anyway! Same for THE ROAD. Until I read Death with Interruptions, Blindness is my favorite of Saramago. The visual from the movie only compounds the disturbing factor of the book. I enjoy reading your thoughts from a psychological perspective. There is indeed a huge difference between seeing and being able to see. It takes others’ eyes to see through ourselves, is what Saramago is trying to express. This is my favorite Saramago so far. (Actually, the only other one I’ve read is The Double, which I actually read first and also loved.) And yes, the scene in the church toward the end is a stunner, also the scene in the bath. All those small gestures and tender moments in the last part of the book were, to me, made all the more beautiful in contrast to the horror that happened earlier. I have the sequel, Seeing, out from the library now, but I’m not sure I’ll get to it before it’s due. 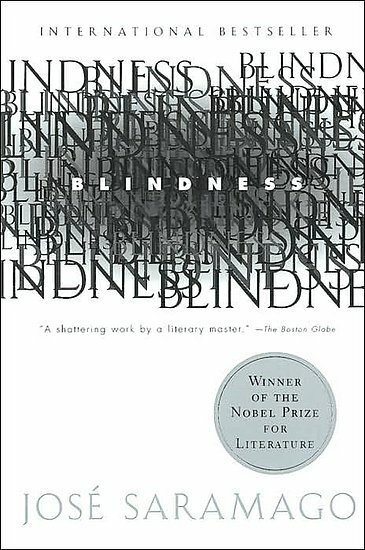 As far as all the questions about the reasons for the blindness and the doctor’s wife’s immunity, I wondered about it but ultimately decided that that’s the way it was because that’s the way Saramago needed it to be. Like Jackie, I don’t think he’s interested in providing medical justifications for it. The same thing was true of The Double. There’s a doppelganger–we never know why. It’s just not a question Saramago cares about. He’s more interested in how a man might deal with the doppelganger–or mass blindness. Saramago is one of my favorite authors. I’m glad you mentioned All the Names. I think Blindness gets too much love at the expense of his other works like The Stone Raft, Baltasar and Blimunda, The History of the Seige of Lisbon. @ Matt: I haven’t read Saramago all that much actually – this was only my second book of his! However, I’m really looking forward to reading more, as I do have a ton of his books around the apartment. Also, I can’t wait to get a copy of Death with Interruptions! @ Teresa: I have a copy of The Double, and the premise there is really intriguing as well, and I’m so looking forward to it! I agree that there are moments of quiet beauty in this novel that shine in contrast to the horror in the early parts of the novel, and I think those moments helped me feel the book was not just bleak and miserable. @ claire: Yes, there are certain authors where I think it’s a given that I’ll enjoy what they do, and Saramago is certainly on that list! Was History the first Saramago you read? I hope you find time to read some more of him soon, because I think you’ll have great insights! Great review Steph! I have had a French translation of the novel for a little over five years on my shelves, I have no idea why I haven’t picked it up yet! It sounds like you enjoyed it though, so I might try to give it a chance too. Silly though this no doubt sounds, I feel guilty for not liking Saramago. This is one of the three of hour novels of his I’ve tried, but no luck. I just can’t get on with his style. Perhaps I’ll try again in the future, though, as with books it’s so often a matter of timing. I’m glad to hear you found it so rewarding! @ kay: My advisor is from Quebec and loves Saramago, but has actually only read his books in French! She said that she loves the French translations, especially of Blindness, so I think you have a treat in store! @ Nymeth: I don’t think it’s silly for you not to like Saramago, because he really does have a very distinct style, and it clearly isn’t for everyone. I’m kind of surprised I like him as much as I do because generally stream of consciousness prose drives me mad but for whatever reason, we gel! I think if you’ve read three of his books then you’ve given him a fair shake. I really need to close myself off to any new books of any variety and settle down with those novels that I have been desperate to read for some time. I don’t understand what’s stopping me – the fear of being disappointed? @ Claire: Given all your reading preferences, I do think you’ll like this book a good deal! It’s just your cup of tea! I think it’s easy to get complacent with authors we’ve already read, and even with the ones we love, there might be the fear, as you mention, that we won’t like any of their other books as much. But I’ve found that revisiting authors is rarely a disappointment, so I really need to do it more too!